Le Marais around the Place des Vosges is one Parisian neighborhood that must not be missed during a trip to Paris. With small, often carless, streets located in the 3rd and 4th district of Paris, this area is full of charm. Filled with smart and stylish boutiques, Le Marais is a great place to visit on Sundays, as many of its stores remain open on a day when most shops in Paris are closed. In addition to posh shopping opportunities and a charming atmosphere, Le Marais features an intriguing sort of diversity that is very unique. Ethnic bakeries and eateries represent some of the hottest spots in the neighborhood as residents and tourists alike crowd small spaces to get a taste of Polish, Middle Eastern and Jewish specialities. With such an abundance of eating and shopping spots, Le Marais is the perfect place to get lost for a day. 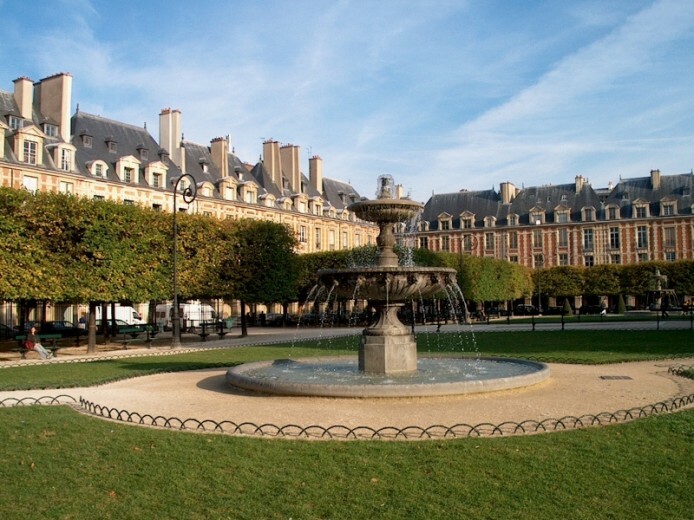 After touring Le Marais, visitors can explore the nearby Place des Vosges, situated in the same area. The Place des Vosges has been classified as a French national heritage site, or monument historique, since 1954. The square consists of a small park encapsulated by XVIIth century buildings. The uniformity of these buildings is what makes the Place des Vosges so special and has led to a concerted effort to protect the square and its buildings from modification. Much like the heart of Le Marais, the Place des Vosges brings together a variety of activities, with shops, art galleries and cafÃ©s all finding their place within this beautiful and protected space. The square is also a residential area, with several famous French figures currently living there. The most famous former resident would probably be Victor Hugo, whose home has been turned into a museum within the square.